How do I chat with residents? 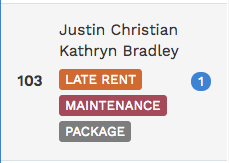 To chat with residents, select a unit from the Unit List, and select the Chat channel you'd like to send from: Payments, Front Desk, Maintenance or Announcements. When the conversation window loads, type your message in the text box at the bottom of the screen and click Send or press Enter to send the message. If the blue bubble appears, you can tell which conversations have the unread messages once you open the unit details. 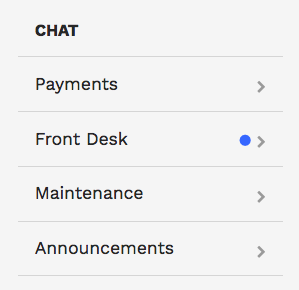 Under the Chat section, chat channels with unread messages are represented with a blue skittle on the button.